I say "finally" because I was pretty young when I noticed that Santa and my mum had the same handwriting and used the same wrapping paper, but there was no "a-ha!" moment, no "How could you lie to me?" devastation. It started with, "Well, isn't that odd?" 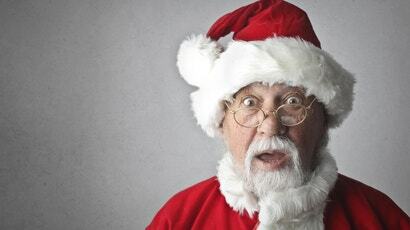 for a few years until I mustered the courage to ask Mum, "Is Santa real?" "What do you think?" she asked, thoughtfully. "Hmm," I said. I didn't want to lie and say I believed, but I also didn't want to say I didn't believe and risk no more presents. "You know what I think?" she said. "I think Santa is real. I think Santa is everywhere. Santa is the spirit of Christmas, the spirit of giving. How do you think that sounds?" "That sounds good," I said, and it worked: I continued to get my presents from the big guy. Even better, though, was I got my answer without any version of "We've been lying to you your whole life." Mum didn't admit a falsehood to me — she just let me in on a little secret. One suggestion that has made the Christmas internet rounds in recent years takes it a step further: Get your kids in on the action, too. That's what one person suggested in this viral Facebook post, which appears to have been originally written by Leslie Rush: Now that you're old enough, you can become a Santa. The post suggests starting this at age 6 or 7, but psychologists agree that parents should take cues from their children. When your child is ready, take them out "for coffee," a solidly grown-up activity. Say, "You sure have grown an awful lot this year. Not only are you taller, but I can see that your heart has grown, too." Then, the post suggests you list a few examples of how empathetic and considerate your child is. "In fact, your heart has grown so much that I think you are ready to become a Santa Claus. You probably have noticed that most of the Santas you see are people dressed up like him. Some of your friends might have even told you that there is no Santa. A lot of children think that because they aren't ready to BE a Santa yet, but YOU ARE." Ask, "What are the best things about Santa?" and "What does he get for all his trouble?" Guide them into a conversation about how it's more than milk and cookies; it's the feeling of joy we get when we do good things for others. Say, "Now you're ready to do your first job as a Santa!" and ask them to choose someone they know and figure out something that person wants or needs. Then, the newest Santa can get that item, wrap it and deliver it — all in secret. Because being a Santa isn't about getting credit but about unselfish giving. Choose a new target each year. The question remains, though: How will you know when your kid is "ready"? Instead of waiting for them to ask outright, follow their cues. When they start asking about the logistics of Santa — What about houses without chimneys? But there's a different Santa at each mall and store. Caroline at school told me there's no Santa; why would she say that? — they're ready. While you are at it, tell them there is no god. Lying is a great way to build society... great lesson for our kids. "Being let in on a secret" is definitely the way to go. When I found out, my mum turned to me one day and asked: "You don't believe in Santa anymore, do you?" I did, but I could feel I was about to be let in on something, so I lied and said that I didn't. She asked me what I really wanted Santa to get me, I told her, and I received exactly that thing for Christmas from Santa. Looking back, I don't think that was the best way to handle it at all, but that feeling I felt, that feeling of being let in on a massive secret, that's far better than crushing a child's spirit. I'm all for letting my children in on it when their old enough.